The Dow rose 50 points, its third consecutive gains, following corporate takeovers and higher-than-estimated profit forecasts as well as easing concern that Japan’s nuclear crisis will curb global economic growth. AT&T climbed 3.3% after buying T-Mobile USA from Deutsche Telekom AG, forming the biggest U.S. wireless-phone company. Share prices of Oracle, Jabil Circuit and Micron jumped after profit or forecasts at the computer-related companies beat analysts’ projections. Meanwhile, economic data was in line with consensus, following the release of the revised 4Q10 GDP of 3.1% and March consumer sentiment index of 67.5. Dow Jones rebounded strongly by 5.8% from 16 March’s nadir, even in the face of the conflict in Libya, Japan's problems and a budget and political crisis in Portugal amid generally positive economic data, strong corporate earnings and rising M&As. This week major economic data in March are consumer confidence (29 March), ADP employment (30 March), nonfarm payroll and ISM (1 April). Major support levels are situated around 12000, 11720 (low Bollinger band) and 11617 (120-d SMA) whilst upside targets are 12376 (daily upper bolinger band) and 12523 weekly upper Bollinger band). 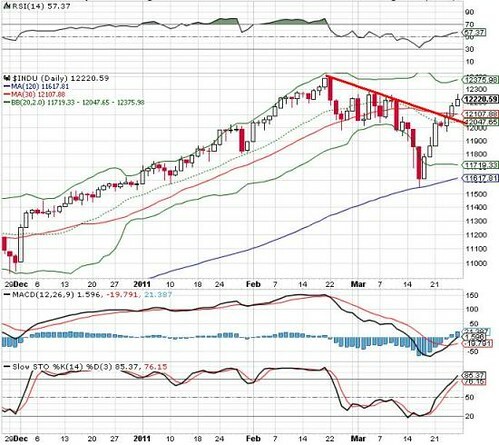 Dow Jones Is Poised To Retest The Upper Bollinger Band Amid Bullish Technical Indicators And Positive Breakout.